Chord’s latest FPGA and advanced WTA (Watts Transient Aligned) filters have been implemented in the Qutest, bringing a wide variety of performance improvements over the 2Qute in a number of areas. Performance gains have been made in timing accuracy, noise reduction and dynamic range and tap length, the technical indicator of how complex the interpolation filter is, has more than doubled compared to its predecessor, to 49,152. Qutest’s control spheres (for user-selectable filters and input) illuminate with useful colour-coding information denoting sample frequency and filter used and the brightness settings are user-adjustable. A further new feature is a user-selectable output voltage available in 1, 2 and 3V RMS outputs for flexible connectivity with partnering devices. 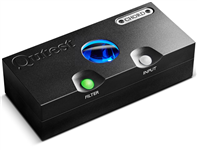 Qutest has three digital inputs and one set of analog outputs. 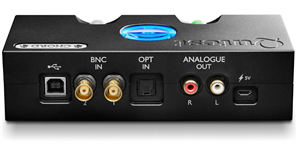 Inputs include: one Optical TOSLink 24-bit/192kHz-capable, two BNC coaxial input 24-bit/384kHz-capable (with dual data mode up to 768kHz) and one HD galvanically isolated USB-B input 32-bit/768kHz and DSD512-capable. Outputs are one stereo pair of RCA phono outputs adjustable to 1,2 and 3V RMS. Qutest is available in black only. Click here for a high-res Qutest image. Materials: Precision machined aluminium casing with polycarbonate buttons and glass viewing portal. - Dimensions (HxWxD): 1.6" x 6.3" x 2.8"
In a nutshell this is one of the best sounding DACs at or anywhere near its price. The 2Qute turns in a performance that's emotionally intense, musically immersive and is really impressive. It's a rare DAC that can do this; the top Chords and dCS machines perform this trick with ease, but there are very few others that can. Late last year I had the distinct pleasure of reviewing the Chord Hugo portable headphone amp/digital converter, it was the best on-the-go rig I've ever heard. The 2Qute lets you hear deeper into the music; it lifts veils from the sound so you hear each instrument and voice more clearly. The music is more immediate, more present, and more alive. If you have never heard recorded music like this you literally don't know what you're missing. In the 2Qute, Chord goes a step further by inserting the latest FPGA technology – the one used in the exemplary $2,495 Hugo. This is a formidable combination, and it results in an incredibly organised and detailed musical performance, delivering an almost-effortlessly cohesive and musical sound no matter what song is played. It's clear the 2Qute outperforms the former Qute Ex. Another success story for the Chordette range. Competitive with top flight CD players from Esoteric, dCS, Accuphase, and EMM Labs, this $1,795 DAC goes head to head and matches them on most scores. This is an absolutely stunning result for the QuteHD. I am wildly enthusiastic about this DAC. The entry-level Chord QuteHD DAC trumped the competition. 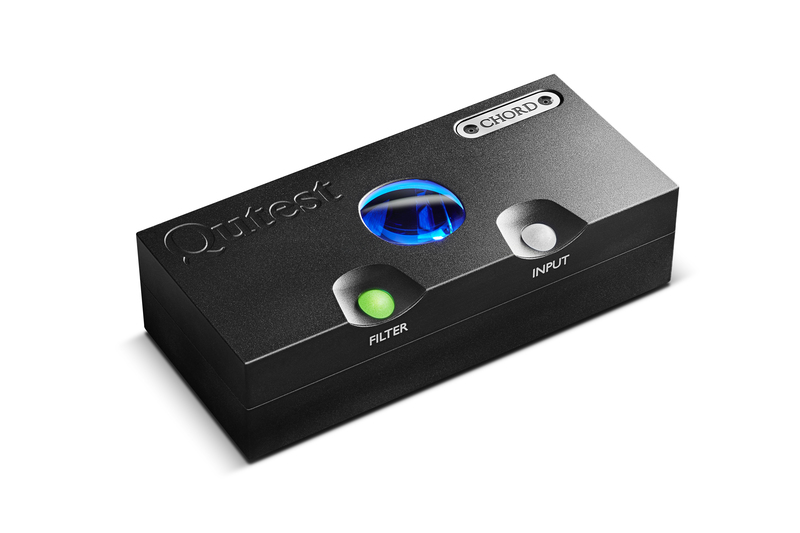 Instead of the presentation rendered by the five-figure CD player, the QuteHD DAC delivered a far more appealing, richer presentation in which edge was replaced by body and substantial color. The Chord is truly exceptional with CD-quality music. The Qute has a way of pulling out a full, dimensional sound from 16/44.1 music files that is quite astonishing. The Chord delivered some of the most convincingly natural sounding CD-quality sound I've yet heard. The Chordette QuteHD makes CD-quality music sound more like HD music. And that's a remarkable conversion. The new QuteHD is exactly what you’ve been waiting for... we’re mightily impressed with the results... it’s a terrific performer. It makes most rivals sound insubstantial and lacking cohesion. Chord has struck gold with the QuteHD. It’s simple, looks great and sounds absolutely fantastic. If you were looking for the star player in this very talented team, the prime candidate has to be the QuteHD DAC. It rewarded me with a truly fabulous performance. Chord has long been a specialist with digital and this little DAC seems to have all of that knowledge condensed within it. Jitter is exquisitely low at 10psec for all sample rates... Chord has set the cat among the pigeons with this affordable but capable and fine-sounding DAC. Trimming the fixtures and fittings back to a minimum and concentrating the budget where it matters most has produced a DAC that will meet most audiophiles' needs while delighting them with sound that belies the keen price. The QuteHD should be heard by anyone looking for a DAC at around $1,700 that sounds as if it should cost a great deal more.